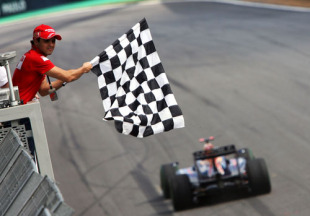 Jenson Button clinched the 2009 world championship with a fifth-place finish at the Brazilian Grand Prix, while Mark Webber took a comfortable victory for Red Bull. Robert Kubica finished a season's best second ahead of Lewis Hamilton in third. Championship challenges from Sebastian Vettel and Rubens Barrichello failed to materialise. Vettel came from 15th on the grid to finish fourth while Barrichello's race fizzled out with a puncture in his final stint. The Brawn driver could take some solace in his team securing the constructors' title for 2009 but the day certainly belonged to Button. The new champion had to fight, however, performing a number of impressive overtakes to move through the field from his 14th place grid spot. He was undoubtedly helped by a chaotic first lap, which saw him gain positions as drivers came together all around him. Jarno Trulli and Adrian Sutil were involved in the most spectacular incident, the pair making contact in turn four behind the slow Ferrari of Kimi Raikkonen. Trulli and Sutil took exception to each other's driving, resulting in a minor scuffle in the run-off area of turn five. More drama followed when Heikki Kovalainen left the pits with his fuel hose still attached, dousing Raikkonen's Ferrari in petrol and causing a brief flash fire. After the first-lap drama, the race settled down with Barrichello leading Webber and Button and Vettel making up time and places further back. Kamui Kobayashi proved to be Button's biggest challenge, the rookie Toyota driver making Button sweat as they vied for position into turn one. Webber took the lead at the first stops, and from that point onwards the Red Bull driver could relax. His closest challengers squabbled among themselves, allowing him to exploit the Red Bull's obvious advantage and drive comfortably to victory. Despite the early dramas Raikkonen finished sixth, ahead of Toro Rosso's Sebastien Buemi. Barrichello's puncture dropped him to eighth as the Brazilian driver's bad luck at his home race continued.